Posted on November 14, 2016 , in Hot Tubs. Adding an outdoor room to your hot tub area is one of the best ways to enhance your experience. An outdoor room can help you increase relaxation, have a space for family time or entertainment, and create a space that feels perfect for your personal style and needs. Below, you’ll learn more about how to make the most of this hot design trend by creating an amazing outdoor room of your own. The first step in creating an ideal outdoor room is to determine your style. Do you want a space that’s casual? Rustic? Sophisticated? Eclectic? If you aren’t sure, it may be helpful to think about the style of the rest of your home or what kind of atmosphere you’d like to create in your outdoor room. The design tips below will help you think about the options available to you. Floors: From decks and hardscapes to gardens and lawns, you have many options for covering the floor of your outdoor room. Outdoor rugs come in a variety of styles and can help you create the perfect ambience. Walls: There are many ways to create the walls for an outdoor room. 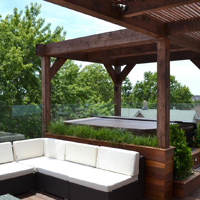 Gazebos, trellises, screens, and hanging plants can be combined to create a space that is beautiful and natural. You can also think about themes and colors that are in line with your style. Lighting: There are many routes to go in terms of lighting. If you entertain, bold, colorful lighting can be a great way to create energy. If you typically use your hot tub to relax in the evening, softer lighting can create a more intimate experience. Visit your hot tub dealer and make sure you buy lighting that is specifically made for these types of spaces. They will have many lighting options to meet your needs. Furniture: Whatever type of atmosphere you’ve decided to create, your furniture should match it. By carefully selecting fabrics and colors, you can enhance the look of your outdoor room. Popular furniture choices include patio tables, chairs, decorative pieces, and planters. Accessories: You can’t create a great outdoor room without the right accessories. For maximum entertainment, think about a bar, stools, and an outdoor sound system. If you want to create an area for the family, full outdoor kitchens or barbeque areas are outstanding choices. Creating an outdoor room can be as simple or as complicated as you want. With a little creativity, you can simply modify your existing landscape on your own without paying to hire a professional. As you begin to plan your outdoor room, get in touch with your pool and spa dealer. They can be immensely helpful during this time. As an example, Hydropool can show you a range of hot tub styles, colors, and accessories and then help you create a built-in hot tub plan. They can even assist you with unique designs like half-in and half-out installation. In addition, your dealer should be able to offer many decking choices including stone, brick, and wood. Finally, a good dealer will provide you expertise in foliage design. Step 1: Decide where your outdoor room will be. Choose a location with an electrical outlet and a foundation solid enough to hold the hot tub. Step 2: Measure the area for decking, paths, trees and plants, and any other design elements you’ll be including. Check your dealer’s website for your hot tub’s specs and size so you know you’ll achieve a perfect fit. Step 3: Start working on your dream outdoor room and have fun!